Whew guys, can somebody just go ahead and erase the last two days of my life? Stomach bugs are the worst. Thankfully, I'm on the mend and looking forward to the weekend. Over the past few months, I've been rearranging the art wall in our living room. I wasn't feeling the way it looked from the last time I overhauled it. With the removal of a few pieces and the addition of a few others, I feel like it finally works. 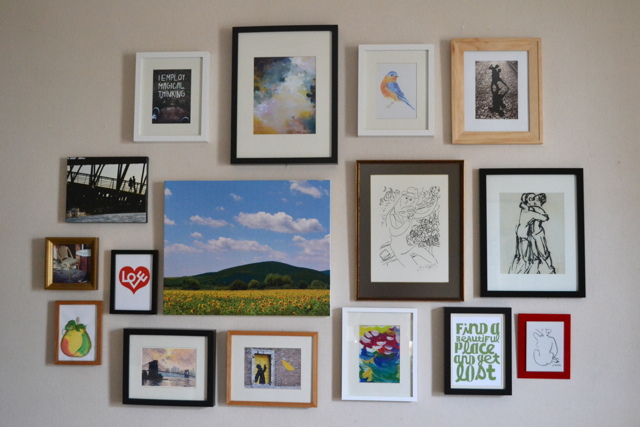 I adore everything up there: the wall includes a variety of meaningful pieces from artists I hold in high regard as well as a handful of my own photographs and paintings. It makes me happy, which at the end of the day, is exactly the evocation I strive towards. Glad you are feeling better! Wall art is so hard to get to work. Yours does and looks great! I'm so happy you're feeling better. And I can't believe I didn't get a better look at your awesome art when I visited last. Maybe I was hungry. That tango photo in the top right corner -- I love that. Have a sweet weekend, Kayla. glad you're feeling better, the wall looks awesome! Love what you did here, Kayla! Also your couch looks so plushh. Wow, I totally pinned this. I love it so much! Sorry you've not been well but pleased that you are on the mend. 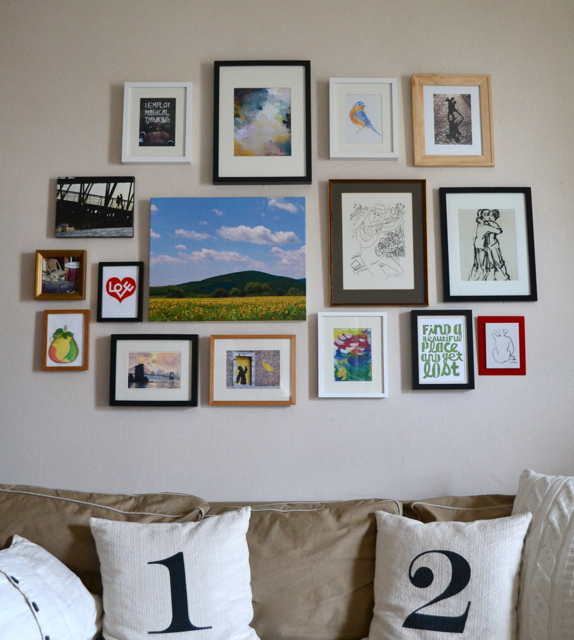 Your gallery wall is brilliant - great job! Have a happy, healthy, art-filled weekend, Kayla! Oh, so sorry to hear (flu bugs really are the worst). Glad you're better just in time to enjoy the weekend - I love that bright & happy wall. Get well soon Kayla and thank you for the best prescription ever - art beats sickness, yeeess! Oh, you poor thing! Feel better soon–there's a light at the end of that tunnel!